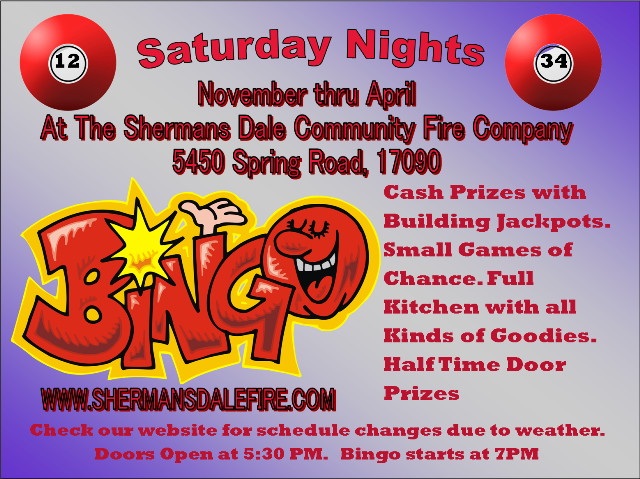 Come out for a fun filled family night of Bingo... This years new Schedule is as follows. A Bingo called in 7 numbers translates to a big cash bonus. Postage Stamp and Diamond Bingo's do count on all Hard Card Games. Also if you bingo on any Hard Card game in 5 numbers or less you get an extra bonus. Win by yourself and spread the joy to your neighboring players with a good neighbor bonus. Propagating Jackpot. Build a 12. If you BINGO on B12 or N34 you get a Cash Bonus. This game has not only a building jackpot every week but has three additional Bingo’s in every game. Down the B’s, Across the Bottom Line and Outside Corners will be also be awarded. Take a short break get to know the folks around you and grab a bite. During this time we will be awarding multiple door prizes. We will also be holding our Pot of Gold Drawing. A building pot with a consolation when it is not hit. 15th game is the Double Postage Stamp. 1st Bingo is a single Postage Stamp on any card. 2nd Bingo is two Postage Stamps on the same card. 1st Bingo can be Inside Corners, Outside Corners or either Diagonal Line. Games 17 to 21 are Hard Card games. 1st Bingo can be any line around the Picture Frame. 2nd Bingo we go for the Crazy “L” which is any 2 connecting lines around the Picture Frame.. This game only has 1 Bingo the completed “T” but we give back everything we take in when selling this game. 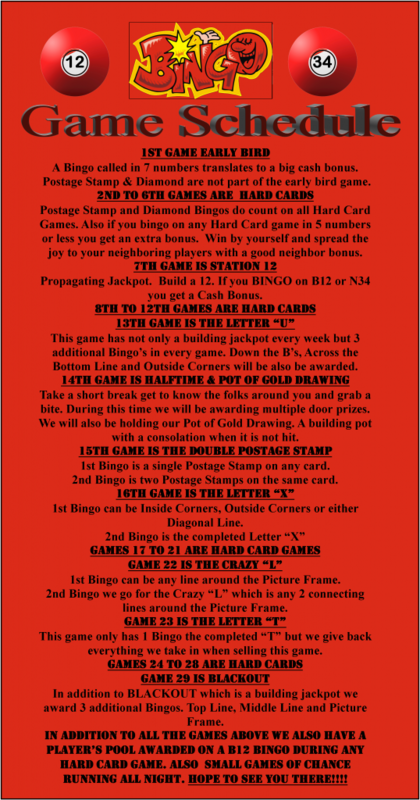 In addition to BLACKOUT which is a building jackpot we award 3 additional Bingo's. Top Line, Middle Line and Picture Frame. In addition to all the games above we also have a player’s pool awarded on a B12 bingo during any hard card game by yourself. and Small games of chance running all night. Hope to see you there!!!! 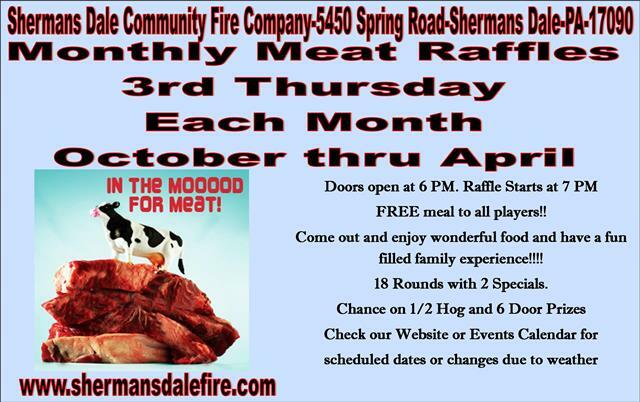 Meat Raffle Doors open @ 6PM Raffle Starts at 7PM. FREE meal to all players!! Come out and enjoy wonderful food and have a fun family experience!!!! DOWNLOAD AND POST TO HELP US SUPPORT YOU. This Years Raffle Dates are October 18th, November 15th, December 20th, January 17th, February 21st, March 21st, and April 18th. Information on this years sponsors and how you can become one. Anyone wishing to assist with, or sponsor any of our events please contact the Fire House at 717-582-2575. We appreciate all the help. Remember we are here for you! Please help us out with fundraising to keep your taxes low.